On account of my digital camera going south on us last summer I wasn’t able to post any picks of the building I did last year. Well Santa was good to us and armed with a new camera I snow shoed down to the sauna and took a few pics. The Timber frame is 12’x16’ with a 4’ over hang off the east or front side. The sills are an odd 8”x12” to provide a sort of lintel for the 12” cordwood walls. The roof is rubber. The west end is an 8’x12’ sauna with cedar benches and the east or front is an 8’x12’ changing room/guest cabin. I still have some finish work as well as a new door to do when things melt a bit more around here and then I’ll post some pics of the interior. I also have two frames to build this spring and I’ll make sure to share some pics of those when I get started in six weeks or so. I bet that suana gets used when the snow piles up too! You would have to drag me out into the cold with that near by. That is a neat little building. I have a couple questions on it if you do not mind. What wood did you use for the posts and for the cordwood? How did you cut and split the wood? 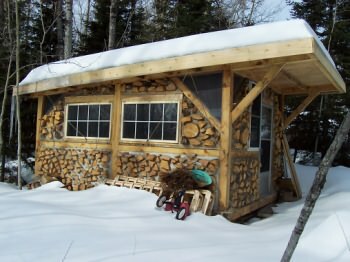 Did you use any insulation in the cordwood wall? What kind of heat do you have in the sauna? How did you decide on a flat roof? It looks like it is plenty strong to hold up the snow loading. You can answer any or none of these questions, just whatever you like. I like to see buildings in this style of construction. You did an excellent job. I will be looking forward to your further pictures. Just one more question, no I better not. The frame was cut from local white spruce, and the walls are spruce, white pine, aspen and white cedar. The white pine I pick up every two weeks from a friend who builds log homes and I take all of his cut offs. The rest comes from slash piles; most of the windowless west wall (sauna) is white cedar. I cut and split all the cordwood by hand. I’m getting fat and it’s good exercise. Besides when building with cord wood you have to plan ahead in order for your wood to dry sufficiently, the cord wood guru Rob Roy preaches three years of drying to avoid shrinkage. It’s really not as much work as it sounds when you do it over a two year period of time and the fact that with all those windows I used just a little more then two cords of split wood. As for insulation we were lucky to have a friend that was paneling his ceiling with some rough sawn white pine, but his wife wanted it smooth so Gary had about 1000bf of pine to plane and he actually delivered the planer shavings; these we tossed with a very small amount of lime to bug proof it. Then when laying the 12” cordwood wall you start with a 4” row of mud then a 4” row of dead space filled with loose planer shavings and another 4” row of mud. MUDGAPMUD. This helps when heating the sauna in that you need only heat the first four inches of cement and then the insulation before you have a “warm wall” if it were a 12” thick wall of wood and mud you would be wasting a lot of energy just to get it warm. The reverse is true in the summer when the sun is striking the outside wall the temperature difference on the inside is amazingly cooler. The sauna is heated by a brick lined woodstove and takes about twenty minutes to get HOT! The flat roof came to me as an idea to save materials and was inspired by several different factors including SIPs and a one hundred year-old sauna built by two Finnish settlers. The roof joists are 4”x6” half let in joints with the top plate, the joists extend past the plate 16” to create the eves; on top of these I used red cedar paneling to extend from eve to eve creating my soffits and my ceiling at the same time. The next layer is six inches of dense foam ESP? preceded by 11mm vapor barrier. I used a net work of true 2”x6”s between the foam in order to have “nailers” and support for the CDX that we attached the rubber roof to. It’s finished with white cedar facia. As for snow load the cool part about the design (unless I missed something…Jim?) is that nearly everything in the frame is under compression, meaning there shouldn’t be any force pushing my walls out, but rather forcing everything down through the posts and onto the foundation, so it should hold a lot of snow. We had over 100” this winter so we’ll see how good a job I did there come the thaw! Buzz The things is I took that Grouper in the pic with a spear gun while snorkling! Thank you for answering those questions on constructing your cordwood sauna. Again, I would like to say, you did an excellent job on this project. I especially like the clever way you are currently storing the door and windows.